I can hardly believe that around this time last year we were getting ready to move into our very first home! And while it’s been a whirlwind of a year, with a lot of wins and just as many losses, I can say with certainty that homeownership has taught me more about myself than I ever imagined. I’ve learned to practice gratitude and patience in the same breath, and most importantly, I’ve learned when and how to confront my husband with bad news. For instance, when a pipe is leaking through the ceiling - call immediately! But if an animal dies in the wall, maybe just wait until he gets home. Together, we've learned that owning an older home isn't for the faint of heart, but we're stronger and more resilient for it and we'll be mighty grateful when this old gal is fixed up and humming along. So what does all this have to do with these lil mini coconut cakes?? Absolutely nothing! Except the fact that this year, we get to spend Easter at home with family (instead of eating pizza on a table made of boxes) and at Mama Bird's house, Easter means coconut cake! These here Mini Key Lime Coconut Cakes (AKA Jumbo Cupcakes) are light, fluffy and not overly sweet. They feature just a hint of key lime and coconut and are best served with a big ole dollop of key-lime infused whipped cream. Top them off with a sprinkle of toasted coconut flakes and you have yourself one delish dessert! I look forward to enjoying these sweet little cakes this weekend with my family and I hope you do as well! If you have trouble finding desiccated coconut (I purchased mine at Sprouts), you may substitute unsweetened shredded coconut. Shredded coconut has a bit more moisture content, but it will work! You can find coconut extract at most major grocers (Publix, Kroger, etc.) but if you cannot find any, just use an extra 1/4 tsp. of vanilla extract. Preheat your oven to 350 degrees F. Then, grease and flour a jumbo 6-cup muffin tin. If you are using paper liners, you can skip that step. In a medium bowl, whisk together the cake flour, baking powder, desiccated coconut and salt. Set aside. Next, place coconut flakes in a skillet and toast on low heat. Remove once they begin to brown, place in a bowl and set aside. In the bowl of your stand mixer, or another medium bowl, cream together the softened butter and sugars using the paddle attachment for about 2-3 minutes or until fluffy. Then, add in one egg at a time, mixing after each egg until just incorporated. Then add in the lime juice, lime zest, vanilla and coconut extracts and mix until just combined. Lastly, add in the coconut milk and stir until just combined. Next, add the dry ingredients to the wet ingredients and stir together, being mindful not to overstir. Then, distribute the batter evenly among the muffin cups, to about 2/3 full. Place in the oven and let bake at 350 degrees F., for about 22-26 minutes, checking for doneness around 22 minutes. The mini cakes are fully baked when a toothpick inserted in the middle comes out clean. Once baked, remove and let cool for about 5 minutes in the pan. Then, transfer to a cooling rack to cool completely. While the mini cakes cool, make the whipped cream. Add the heavy whipping cream, sugar and lime zest to the bowl of your stand mixer and mix on high until stiff peaks form. Tip: Make sure the heavy whipping cream is very cold. You can also place the mixing bowl in the fridge/freezer before mixing to help. Once the mini cakes have cooled, top with whipped cream using your favorite icing tip or a good ole fashioned dollop. Then, sprinkle with toasted coconut and a slice of lime and serve! I’ve decided that the only thing better than actually receiving flowers, is eating them! So for Valentine’s Day, I set out to make a lemony sugar cookie, coated with just a hint of pink icing and decorated with a sprinkle of vibrant, edible flowers! The result is almost too beautiful to eat! And delicious! I'm looking forward to making these for bridal showers and springtime celebrations alike and think they'd be just as pretty cut into the shape of a circle or square with fluted edges. If you’re new to edible flowers, please note that they do not impart any real flavor. And whether you serve them fresh or slightly dried, you’ll find the texture of the soft cookie and slight crunch of the icing will completely distract you from their own delicate texture. In other words, they’re just for looks! I like to get my edible flowers from the herb section at either Sprouts or Whole Foods Market. You might also be able to find them at your local Farmer’s Market in the spring and summer or you could always grow your own! Just be sure that they are organically grown and free of pesticides. Now to make these cookies, I simply used scissors to cut the petals into a sort of floral confetti. Then, I iced the cookies using a “flooding” technique and sprinkled on the flowers. Once the icing dries, they are ready to serve! If you make these in advance of your celebration, you may notice the flowers lose a bit of moisture and begin to dry out. They’ll look more like colorful potpourri and will be just as beautiful! There are lots of techniques when it comes to icing cookies, but I find the flooding technique to work best. For these cookies, I didn't bother with creating an "outline", but simply used royal icing adjusted to a flooding consistency (with a bit of water) to create the little hearts. For a great step-by-step tutorial packed with helpful information, check out Julia Usher's video here. Disclaimer: It's lengthy, but you'll be glad you watched it! Note: One lesson I've learned the hard way is that sometimes too much food coloring can alter the icing's texture. In my experience, the icing tends to take on a filmy look and becomes sticky. I'm sure there are ways to avoid this, but I just kept it safe and use the tiniest little drop of red in about 1 cup of royal icing to get the soft shade of pink shown above. As always, I hope you enjoy this recipe and thanks for stopping by! In a large bowl, whisk together the flour, baking powder, baking soda, and salt. Set aside. In another bowl, or the bowl of your stand mixer, cream together the butter and the sugar until fluffy. Then, add in the eggs and mix until just combined. Lastly, add in the vanilla, lemon juice and lemon zest and mix just until combined. Next, take your dry ingredients and slowly incorporate them into the wet ingredients, stirring or mixing until just combined. Use your hands to fold the dough into a ball and wrap tightly with plastic wrap. Place in the fridge to rest while you prepare the icing. In the bowl of a stand mixer or a large bowl, add the two egg whites and beat on high with the whisk attachment (or your handheld mixer) until foamy. Then, slowly add in the confectioner's sugar, about 1 cup at a time, until mixed together. Lastly, add in the lemon juice and vanilla extract and mix on medium high speed until soft peaks form and the icing is nice and thick. The icing is the right consistency when it clings to the whisk and doesn't drip. Or as Julia Usher says, it should be like "glue". Once your icing is ready, divide it up into two bowls (one for white icing and one for pink), or as many bowls as you'll have colors. Then, add in a bit of water to each bowl, about 1 tsp per 1 cup of icing and stir until the consistency is thin enough to run off the spoon and pool, but not so thin that it's watery and will run off the cookie (again ,check out her video for visuals!). Once the icing has been made, remove the cookie dough from the fridge and let set out for about 5-10 minutes. Meanwhile, preheat the oven to 350 degrees F. Then, use a rolling pin to roll out the dough (I like to work in batches) to 1/4" thickness. Cut out the cookies using your favorite cookie cutters and place on a baking sheet lined with parchment paper. Be sure to give the cookies a little bit of space in case they puff up. Bake each sheet of cookies for 6-8 minutes or until they are set and just barely starting to color. Remove from the oven, let cool for a few minutes and then transfer to a cooling rack. Once the cookies have cooled, you're ready to decorate! 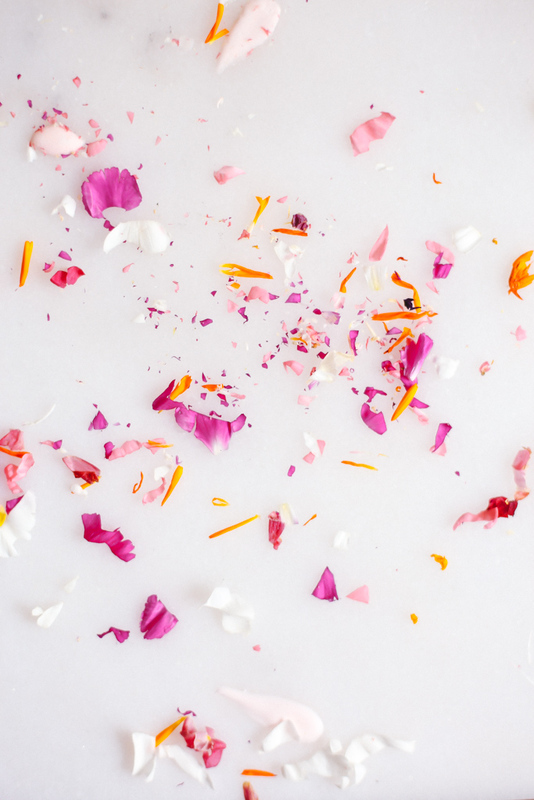 Use scissors to cut the edible flowers into small strips of confetti. Then, ice each cookie using the flooding method demonstrated in the video linked above and here. Use a toothpick to pop any air bubbles in the icing and sprinkle the cookies with your flowers. Set aside to dry completely. Then serve and enjoy! This week marks Feast & Fable’s 1 year Blogiversary! And my how she’s grown! A part of me can hardly believe it’s been a year already and another part feels woozy just thinking of all that’s transpired in the last 12 months. One thing’s for sure, I’ve loved every minute of it! I was pretty certain when I launched this blog that my mom would be my only reader, and while she’s pretty great, it brings me so much joy to watch this little community expand to include new friends at the table, friends from all over the world. Now if only I could find a way to gather everyone together for one giant dinner party! Wouldn’t THAT be great!? But until we get those logistics figured out, we’ll just have to settle for this celebratory Spiced Carrot Cake. Which isn’t a bad way to go, considering she’s wrapped in a Brown Butter Frosting and topped with a Salted Caramel Drip. And when I say topped, I mean more like drenched, because caramel does weird things when you’re air conditioning is broken and it’s 90 degrees outside. This Spiced Carrot Cake is perfect for fall gatherings. Made with a blend of cinnamon, cardamom, nutmeg, ginger and cloves, it bakes with a bit of applesauce in place of oil and includes 2 heaping cups of freshly grated carrots. This recipe yields three large 6” cake layers and makes for one beautifully tall layer cake. You could also make two large 8” cakes and serve each layer individually. I especially like this idea for afternoon tea! Regardless of how you stack it, it will be delicious! And as always, I hope you enjoy this recipe as much as I do. Thank you for following along and giving life to this great adventure. I look forward to bringing you many more recipes (and ramblings) this year. *I recommend freshly grating the carrots versus opting for the pre-shredded store-bought carrots. I tried those once in hopes of saving time, but find they are very dry and do not release much flavor. If you have a food processor, use the grating attachment - works like a charm! Preheat the oven to 350 degrees F. Grease and flour 3, 6” cake pans. Set aside. In a medium bowl, whisk together the flour, salt, baking powder, baking soda, cinnamon, nutmeg, ginger, cardamom and cloves. Set aside. In the bowl of a stand mixer, or a medium bowl, add the brown and white sugars and the butter. Beat until light and fluffy, about three minutes. Then, beat in each egg, one at a time. Lastly add the vanilla and applesauce and beat until just combined. Next, pour the flour mixture into the wet mixture. Mix until just combined. Lastly, add in the shredded carrots and stir to combine. Pour the batter evenly between the cake pans and place in center of the oven. Check for doneness around 35 minutes, but it’s likely they will need to bake for about 40 minutes. Once baked, remove the cake pans from the oven and let cool. Once cooled, flip each layer out of the pan, dome side down, on a cooling rack. Use a butter knife to help loosen the edges if needed, but be careful not to cut into the cake as a smooth edge makes for easier icing. While the cakes finish cooling, prepare the frosting. Place the butter in a sauce pan over medium heat. As the butter begins to melt, it will foam and the color will begin to change from a pale yellow to a golden yellow and finally to a toasty-brown color. Give the pan a swirl as it heats to cook evenly. Once you smell a nutty aroma and the color is toasty-brown, quickly remove the pan off the heat and transfer to the bowl of a stand mixer or a mixing bowl (leave any sediment behind). Next, add in the confectioner’s sugar, a pinch of salt, the vanilla extract and 1 Tbsp. milk or coconut milk. Beat until the frosting is light and fluffy. If the frosting is too thin, add a bit more of the confectioner’s sugar. If the frosting is too thick, add another dash of milk. The frosting should be thin, but spreadable. First, use a sharp knife to level each cake layer. Then, place one layer on a cake stand or plate and spread an even layer of icing on top. Next, place the second layer on top of the first layer and repeat with the icing. Lastly, place the last layer of cake - bottom side up - on top of the second layer. (Placing it bottom side up gives you a smooth and even surface on top.) Place a large heap of icing on top and spread until smooth. Use a small offset spatula and give the entire cake a crumb coat of icing. Then, place in the refrigerator to set for about 10-20 minutes. Once chilled, remove the cake and apply another thin layer of icing. Place back in the refrigerator to chill while you prepare the caramel. You can opt to make your own caramel or purchase an already made caramel sauce if you are short on time. For this cake, I chose to use Trader Joe’s Fleur de Sel caramel sauce. Regardless, you’ll want to heat the caramel in a saucepan and whisk until it’s thin and easily spreadable. Remove from the heat and let cool for about 5-10 minutes. Then, remove your cake from the refrigerator and slowly pour the caramel on top of the cake, a few spoonfuls at a time. Use your offset spatula to gently smooth the caramel over the top of the cake and allow it to drip over the edge. You can add as much or as little caramel as you like! Once you’ve finished creating the caramel drip, place back in the fridge to allow the caramel time to firm up a bit. Then, serve and enjoy! I'm having major anxiety about summer ending. And it’s only mid-July. Because this is my season, the time of year that brings me to my knees and I'd be perfectly happy if it went on forever. It’s not just the warm days and hazy summer light that gets me, it’s fingers stained red from pitting cherries. It’s frizzy hair and wearing a cloak made of heat and humidity. It’s going on hikes after dinner and reading in hammocks over the creek. It’s falling asleep to a chorus of crickets and waking up in a sun-filled room. It’s all just so perfect. And I’m determined to soak up every last moment of it. And what celebrates summer more than ice cream? Growing up, my sister and I would save our money for the chocolate chip ice cream sandwiches at the swim club. We’d peel back the wrapper and devour them with soggy, wet hands, while our bathing suits dripped around our feet. Perhaps the best part was the thick coat of cookie crumbs and chocolate that stuck to our fingertips and required the sharp edge of our teeth to come clean. This memory came to me the other day and it wasn't long before I was dreaming of cookie and ice cream combinations. Chai ice cream with oatmeal cookies would be amazing, or a lemony cookie with lavender berry cream...the options are endless. I ultimately went with this heavenly combination of pistachio ice cream and dark chocolate, smoked sea salt cookies. The result is a creamy savory-sweet ice cream that tastes of pistachios and almond. The saltiness of the cookie begs for something cool and creamy and this ice cream pairing does just the trick. This recipe does not require a fancy machine, nor does it require tediously stirring the mixture every 30 minutes. In fact, it comes together in less than 20, allows the freezer to do all the work and has the consistency of creamy, well-churned, easily-scoopable ice cream. Line your bread tin with parchment paper to make for easy cleanup. Alcohol lowers the freezing point of the ice cream, making the consistency softer and easier to scoop. It is of course optional, but recommended. To make this recipe dairy-free, try making a sweetened condensed coconut milk base, like this one here. Then, replace the heavy whipping cream with full-fat coconut milk. Allow the ice cream to set out for about 5 or so minutes before scooping. After assembling the ice cream sandwiches, place them back in the freezer for a bit to firm up. You’d think the cookie would freeze and become too hard to eat, but much the opposite is true. In fact, I’ll pull them out of the freezer and serve them immediately and the cookies are firm enough to hold the ice cream, but soft enough to bite into. As always, thanks for stopping by and enjoy! 1 cup, unsalted pistachios, shelled, plus additional pistachios chopped for topping. Place the pistachios in a coffee grinder or food processor and grind into a paste. If using a coffee grinder, you may have to work in batches, but you’ll get more of a pistachio dust than the more liquid paste created by a food processor. Both work fine for this recipe. Once you’ve created the powder/paste, place into a blender and add the vanilla extract, almond extract, sweetened condensed milk, vodka (if using) and a pinch of sea salt. Blend until smooth. Then, pour into a large bowl and set aside. Next, take 2 cups of very cold heavy whipping cream and place into the bowl of an electric mixer. Using the whisk attachment, whip on high speed until the cream begins to thicken, form peaks and become fluffy, about 3-4 minutes. Using a spatula, take about two or three dollops of the whipped cream and gently fold into the blended pistachio mixture. Then, repeat, carefully folding in another few dollops of the whipped cream and finally add in the rest and fold until blended. Be mindful not to over mix. Line a bread pan with parchment paper (optional, but makes for easy cleanup) and pour half the ice cream mixture into the pan. Sprinkle the top with chopped pistachios. Then, pour the rest of the ice cream mixture on top, and gently swirl to combine. Cover the bread pan with a layer of plastic wrap and then a layer of foil and place in the freezer overnight or for at least 4 hours. 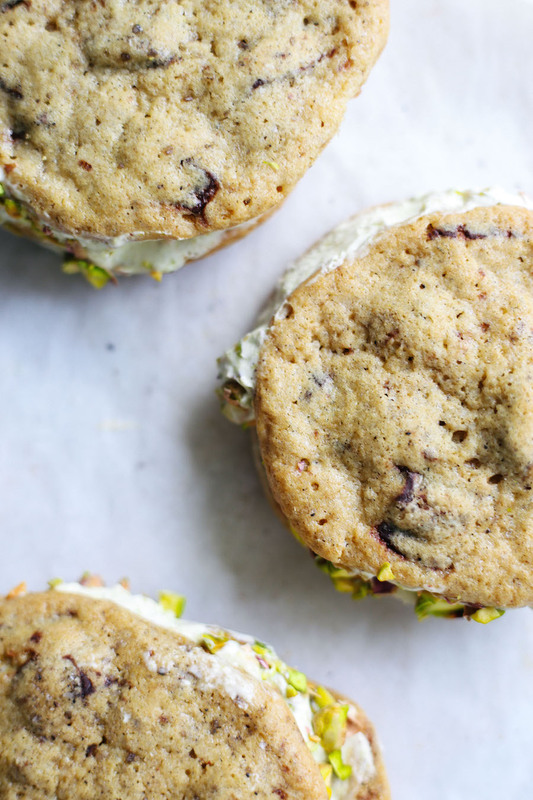 To serve, remove from freezer and sprinkle with additional pistachios. Preheat the oven to 300 degrees and prepare two cookie sheets. In the bowl of an electric mixer fitted with a paddle attachment, beat the butter and sugars together until fluffy, about 3-4 minutes. Then, add in the egg and beat for an additional minute. Lastly, add in the vanilla extract and beat just until incorporated. Next, in a medium bowl, combine the dry ingredients. Whisk together the flour, baking soda and salt. Then, pour the dry ingredients into the butter mixture and beat on low speed until just incorporated. Lastly, mix in the chocolate chunks. 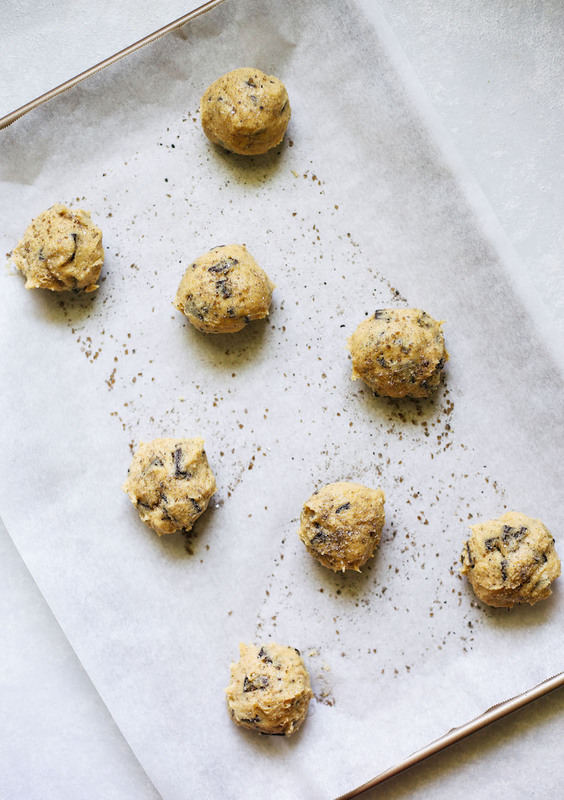 Dollop or scoop cookie dough by the 2 tablespoonful onto prepared baking sheets. Leave about 2 inches of room between each cookie. Sprinkle generously with smoked sea salt. Bake in the oven for 18-24 minutes, or until just golden brown. Remove from the oven and allow to cool for 5 minutes before removing to a wire rack to cool completely. Oh, friends. Sometimes I just wake up with so much joy in my heart that I feel I could simply explode. Or bust through the wall or maybe just pass out. Does this ever happen to you? It’s not to say I’m this bright and optimistic every morning, that would be my husband, but there are days when I look at a bunch of carrots and tears just well up in my eyes. Because look at them. Can you believe their radiant, brilliant color? The bright, unmistakable orange that only gets brighter after a good wash and a quick peel. The way the thick-rooted vegetable stems from the softest, leafy greens. It’s these naturally occurring combinations of texture, color and pattern that make me stop in my tracks. It’s art in the purest form, and I find it so magnificent that I decided to dedicate my life to capturing it all. Because joy is way more fun when you have someone to share it with! This post, these recipes, are dedicated to the idea that cooking does not have to be complicated. In fact, the very best meals rely on the flavors that exist naturally. All you need is fresh produce, a spot of olive oil, some good salt and maybe a fresh herb or two. And then the fun really begins! As you bite into these grilled carrots, or slice one of these delicious peaches, you realize just how simple it all really is. And how beautiful. I hope these recipes inspire your next outdoor gathering, and if anything, invite you to take a moment and recognize the sheer wonder of it all! Heat the grill to medium. While the grill heats up, peel the carrots and place on a baking sheet or in a large dish. Toss with olive oil, cumin, a pinch of salt and black pepper. Once the grill is ready, place the carrots directly on the grill and close the lid. Let cook for about 10 - 12 minutes, or until they can be easily pierced with a fork, and rotate every so often to evenly char. Once cooked, remove from the grill and top with feta, pine nuts and mint to your liking and another drizzle of olive oil. Heat the grill to medium. While the grill heats up, slice each head of bok choy in half lengthwise, allowing the leaves to remain in tact. Then, rinse the bok choy under cool water to remove any dirt and pat dry with a paper towel. Place the bok choy cut-side-up on a baking sheet and drizzle with olive oil and a pinch of salt. Once the grill is ready, place the bok choy directly on the grill and let cook for about 3-4 minutes on one side, then turn and cook for an additional 3-4 minutes or until the leaves are wilted and charred. Serve one-half for each guest and enjoy! To make the whipped cream, place 1 cup of very cold heavy whipping cream in the bowl of an electric mixer. Mix on high speed for 3-4 minutes, or until peaks begin to form and the cream is fluffy like a cloud. Set aside. Then, heat the grill to medium and slice and pit the peaches. Drizzle with a bit of olive oil and place directly on the grill cut-side-down. Let cook on the grill for about 3-5 minutes or until they form nice grill marks and then flip and cook for an additional 3-4 minutes on the other side. Remove from the grill, and plate with a dollop of whipped cream. 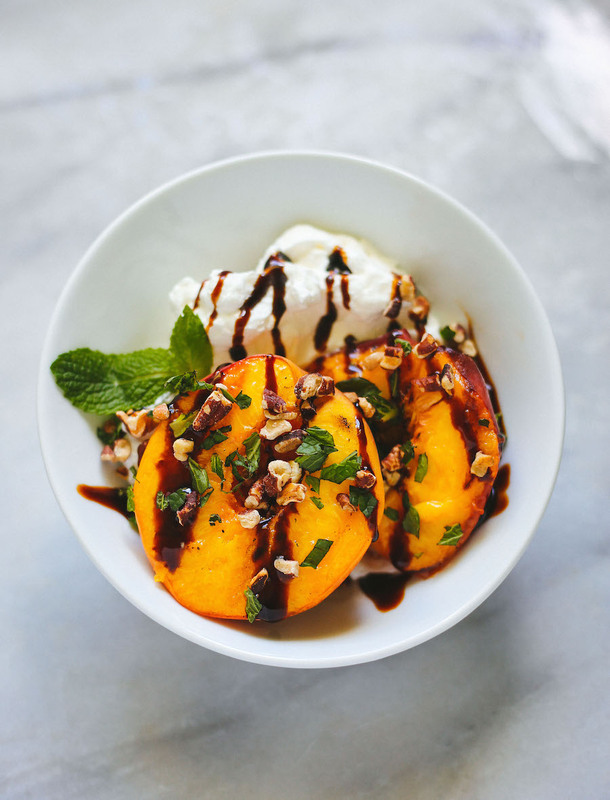 Drizzle with balsamic glaze and honey and garnish with chopped mint and toasted pecans.